I have a theory that Instagram filters were invented to make the rest of the world look a little bit more like Los Angeles. Not that it’s particularly beautiful but there’s something about the air, or the light, or the architecture that somehow manages to make even the mundane seem inexplicably cool. We arrive mid-afternoon in a bad mood. Open freeway had branched into impatient tributaries of traffic some time ago, and my nerves are shot from dealing with Americans’ aversion to letting people change lane. Miss your turning in the maze of downtown LA and there’s no way of telling where or how far your day could take you. The Ace Hotel though is a balm for the soul; with record players and highend food magazines in every leather-desked, brass-fixtured room, it’s a safe space for the ageing beer adventurer, and I take a minute to bask in the loveliness of it all before heading back out to meet Fraser. We only have one thing on our agenda for the evening: Mikkeller’s exciting new ‘DTLA’ bar and restaurant, which is just around the corner. Opened just four months ago by Mikkel Borg Bjergsø’s man in LA, an energetic and charming Brit named Will, the bar is already considered one of the city’s best for beer and is pulling in numerous awards. It’s not hard to see why. It has obviously mastered that peculiar Mikkeller trick, of being utterly cool with apparently minimal effort (don’t be fooled though; everything these guys do is calculated to the nanometer) but it’s really the beers that are the star here. 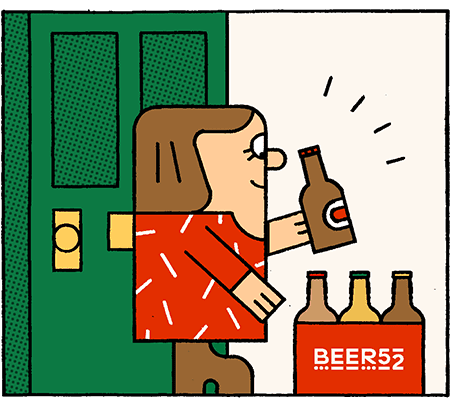 As well as a great selection of fresh and fascinating brews from Mikkeller’s own brewery in San Diego – where we’ll be heading shortly – there’s an exquisitely curated beer list from the very best breweries from America and Europe, on draft and in bottle and can. It is literally impossible to go wrong. We also meet Tyler, a Wisconsin native who followed his passion for beer down to the sunshine state a little over a year ago and has been working with Will at Mikkeller DTLA since the start. He is – like all the staff here – ridiculously generous with his time on a busy night. When it finally comes time to leave, we manage to persuade Tyler and a couple of the others of the Mikkeller crowd to join us at the Ace Hotel’s roof bar for a nightcap, which inevitably extends into the small hours, sipping whiskey by the pool and discussing life, beer and this amazing city. The next day is a big one though, so there’s no time to nurse our wounds. Sierra Nevada’s Beer Camp in Long Beach is one of the main reasons we planned our visit for this week and we’re keen to get out and soak up some sunshine.